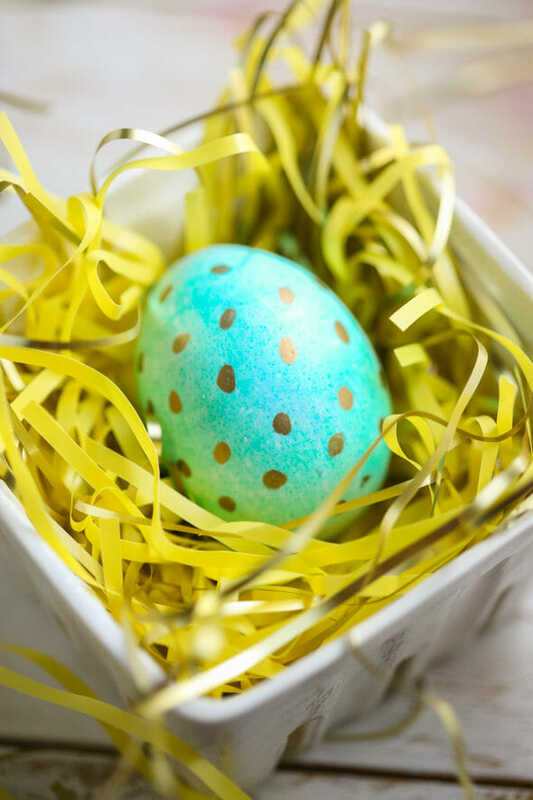 We have quite a few out-of-the-box egg decorating ideas (and when I say “we,” I mean Sara; let’s just say fancy egg decorating is kind of traditionally outside of my wheelhouse)–we have these dinosaur eggs and these egg ornaments and, of course, these eggs that are literally dyed in men’s silk ties and kind of took the Internet by storm. Guys, I lack the crafty gene. There are some elements of the crafty world that I get super into, but I lack the spatial awareness to sew (I literally sewed an entire children’s bear costume with the fur on the inside and the sleeves on the wrong arms), I lack the artsy skills to draw (my dogs look like deranged hybrid horses), and, generally speaking, I just don’t seem to have the patience necessary to disassemble a wood pallet and then turn them into high-end furniture for hipster infants. 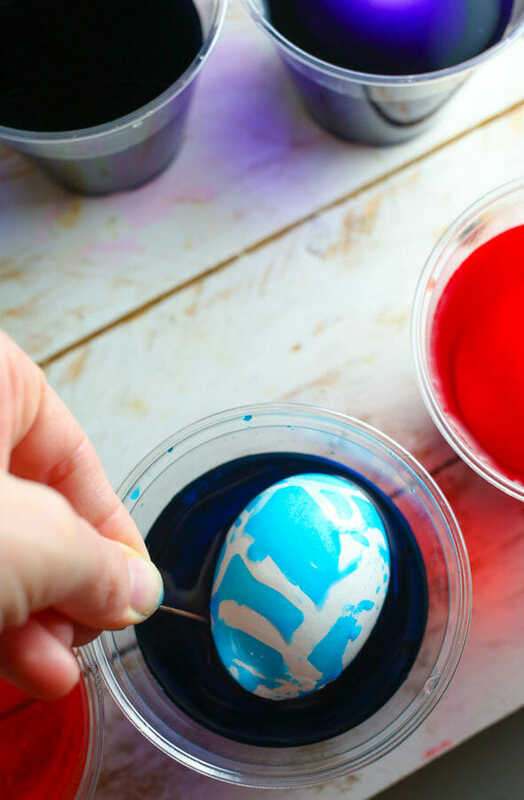 I do like the idea of fun Easter eggs and I’m sharing a few really quick ideas that are simple enough for even me, Kate, destroyer of all crafts. No matter what you do, you’ll need a whole bunch of hard-boiled eggs (you’re going to want to actually boil them–while I love baking them or using my pressure cooker, you can only make a few at a time in the pressure cooker and baking them sometimes leads to discoloration.) I also used rubber cement and metallic Sharpies. Speaking of rubber cement, did you know that a) it’s next to impossible to find these days and b) you have present your ID in order to purchase it?? I was so excited to get carded–I’m pretty sure it’s because it’s a controlled substance (so, obviously, keep an eye on the kiddos if they help you out here), but I like to think it’s because I look far too young to be purchasing glue in a jar. 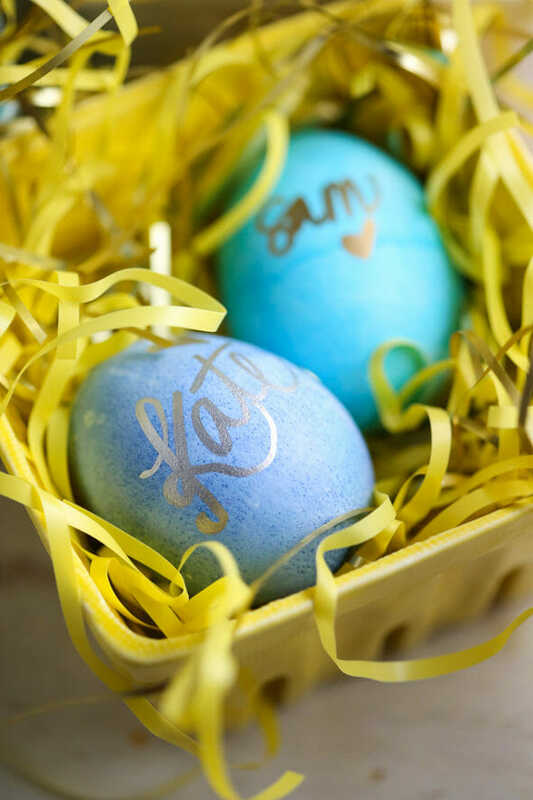 You can also write names on the eggs, either just for fun or you could even use them as placeholders at Easter dinner. Again, I don’t have all the fancy calligraphy skills, but I do feel like I have reasonably adorable handwriting. Now. 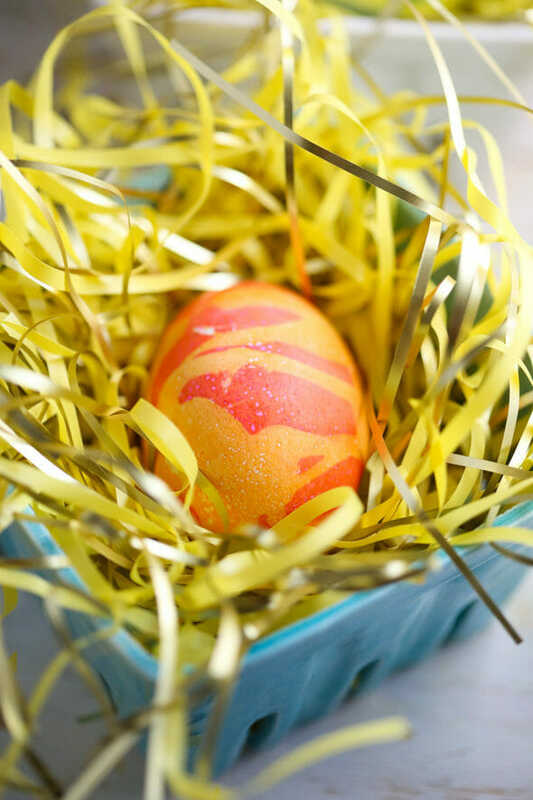 To make these funky semi-psychedelic eggs (again, be careful with the glue so things don’t get too psychedelic), take your hard-boiled egg and some rubber cement. 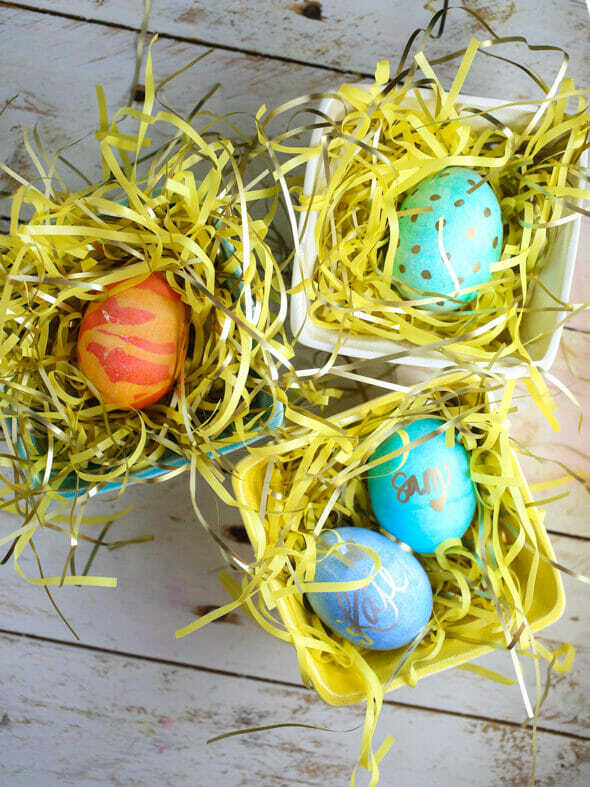 Choose two coordinating or complementary colors and dunk the egg in the lighter color first. Let it sit there until the desired shade is reached. Allow the egg to dry, then peel off the glue (side note–my 5th- and 3rd-graders seem to do a lot more actual school than I did when I was their age because they knew nothing about spreading Elmer’s white glue over their hands and then peeling it off after it dried. Children truly are the future, guys.) 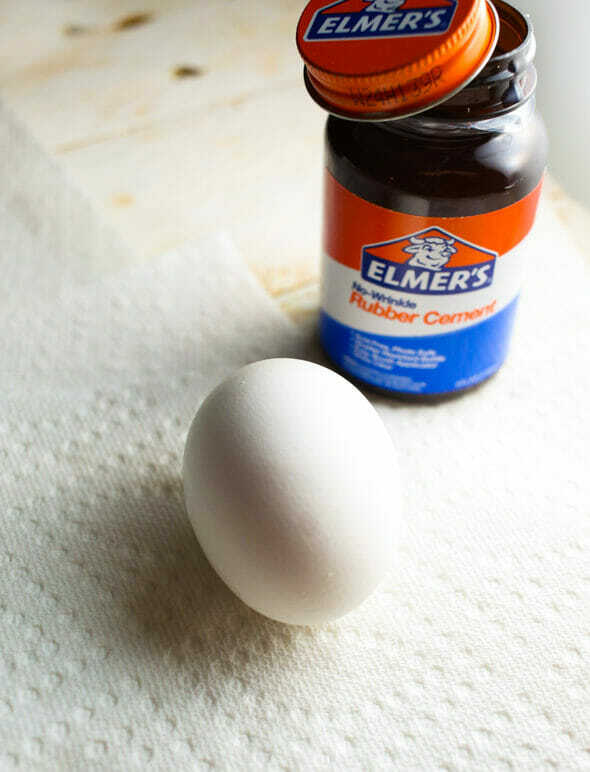 Then pop the egg in the darker color for just a few minutes. They’re so cool! I should note that because eggs are porous and because both Sharpies and rubber cement are a little heavy on the fumes, it’s probably not the best idea to eat either of these eggs. Save a few good ol’ fashioned eggs from the toxic chemicals for your edible eggy needs. We’ll be sharing lots of things from our archives over the next few days, so stay tuned! Happy spring! I can assure you that children still know the “peel the glue off your hand” trick – I caught multiple kiddos doing it last time we had glue out in my classroom! I have done the silk eggs before and they are gorgeous, but with Easter and report cards coinciding I think these ones are more my speed this year! There’s a good tutorial in this month’s Food Network Magazine about dyeing eggs with food coloring. Between this post, that article and a snow day, I might actually do some of these this afternoon! These eggs are so pretty! I’m obsessed! Hmmm… that comment makes it sound like my infant is indeed a hipster. He is not. He is just a regular infant. Probably bc of my lacking craft skillz. HAHA!! I loved reading this post. I’m still laughing about “getting carded” and not letting things get too psychedelic. After a few years, this is still our favorite site for all things fun! I’m so not crafty in the same way as you! Cute eggs! Thanks for the ideas! 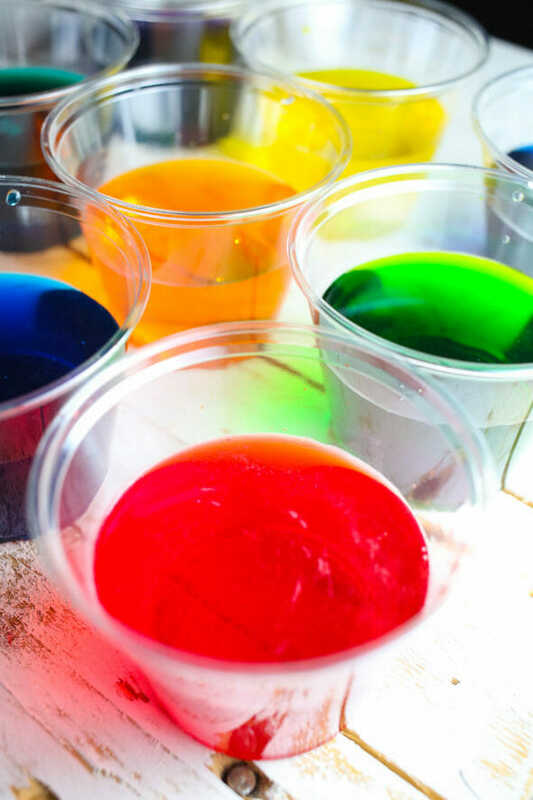 My mom always added a drop of mineral oil to the egg dye. 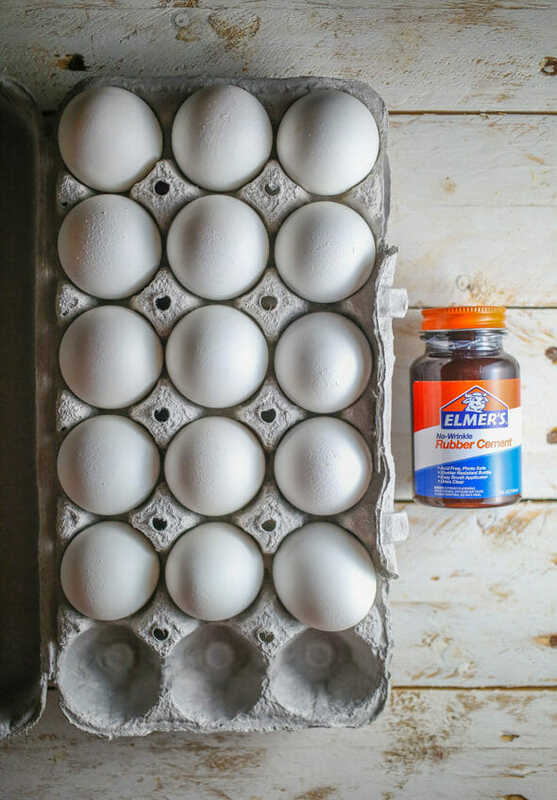 It creates a swirly look similar to the rubber cement eggs, but no peeling or chemicals.